On Saturday evening, my Creative Landscape Photography workshop on Point Reyes was lucky enough to have the lighthouse opened for us. I shot this image handheld with my Nikon D810 and a 16mm digital fisheye lens (the interior space was pretty tight). I used auto-bracketing and burst mode. There were nine exposures, each at ISO 1250 and f/6.3, with shutter speeds ranging from 0.5 of a second to 1/500 of a second. I combined the exposures using Nik HDR Efex Pro and Photoshop. Some related images: Lighthouse in the Fog; Night at the Point Reyes Lighthouse; Inside the Lighthouse; Owl’s Head Light. Over the weekend on Saturday I led a fun workshop sponsored by the Point Reyes Field Institute on Point Reyes photographing Waves. I had some very enthusiastic participants and I think we all had a good time. It was fun to be leading a workshop so close to home compared to my recent travels, and there is no doubt that Point Reyes National Seashore is a visual resource and national park second to none, no matter how far one might roam. I was able to make some of my own images during the course of the workshop, and I found that this year I was mainly interested in created abstractions using longish exposures and motion. The top image, In a Blue Hour, was a ten second exposure, with my camera on tripod. Here’s the full exposure data: 44mm lens, circular polarizer, 10 seconds at f/29 and ISO 200, tripod mounted. The two versions of Wave Study (above) were shot handheld at 1/2 a second. I stopped the camera down to f/22 and used both a polarizer and a neutral density filter to enable the longish exposure despite the day light. The full exposure data is: 300mm, circular polarizer combined with +4 neutral density filter, 1/2 of a second at f/22 and ISO 31, hand held. Stormy Sea, Point Reyes (above), was also shot hand held. The full exposure data is: 150mm, circular polarizer combined with +4 neutral density filter, 0.6 of a second at f/29 and ISO 31, hand held. Related stories from some of the previous Waves workshops in years gone by: Photographing Waves (2014); Photographing Waves (2011); also Faces of the Deep. On Point Reyes in the spring, I photographed the details of the deteriorating buildings in the historic (but abandoned) D Ranch. Walking back towards my car I turned and saw the ranch buildings against a dramatic sky. There was no choice: I had to pull out my camera and tripod again. The ominous appearance of the clouds was exaggerated by adding a polarizer, and by creating a long exposure by using a neutral density filter. I like the image best in black and white, but the color version has some appeal as well. Point Reyes National Seashore is probably unique among the American National Parks in that this public land is shared with working cattle and dairy ranches. These ranches date from the early 1800s and are very much a part of the history of Point Reyes. Many have been in the same family for generations. Parking my car beside the road, I scrambled down a steep bank, crossed through a tunnel under the road, and found myself in the abandoned out-buildings of D Ranch. The scene shown in the image—a door within a door within a window—with stark contrasts between light exterior wood and dark interior was too good to pass up, so I stopped to make this monochromatic image with my camera on my tripod. Related story: Monterey Cypress Row on Point Reyes. On my way to teach a weekend Seascapes and Wildflowers workshop at the western tip of Point Reyes, California I stopped to photograph the well-known row of Monterey Cypress trees at the Marconi operations center. This tree tunnel is one of the largest in the world made up of these trees, and marks a historically significant wireless location. Certainly, there is something very dramatic about coming upon these trees standing by themselves in the windswept landscape of Point Reyes. By the way, the workshop was great fun with a truly compatible group of photographers. Many photos were made, participants came from as far away as Florida and New Jersey, and the sense of community that marks the truly successful workshop was indeed present. The workshop base was the historic Coastguard Boathouse, where we were surrounded night and day by elephant seals and sea lions. Thank you Point Reyes Field Institute for hosting this—and many other—memorable workshops over the years! Here’s an iPhone capture from the classroom window at the Boathouse of the ramp used to guide out rescue boats when the place was operational, with the window cloudy with salt spray. Over the years, I have photographed the beached and slowly decaying Point Reyes trawler, located near Inverness, California, by starlight and by daylight in the afternoon. This photo was by iPhone, made while my boys clambered over the wrecked vessel. On the Friday of the Thanksgiving weekend I drove out with my boys—Julian, Nicky and Mathew—to Point Reyes. Nicky’s friend Tamen came along too. It was a balmy, almost summer-like day. As I told people on my recent trip to Japan, we are lucky to live so near such a beautiful, spacious and wild park as Point Reyes National Seashore (many of them couldn’t believe my description in terms of the sheer amount of wild land with so few people near a major city like San Francisco). We parked at Drake’s Bay, and walked along the beach under towering bluffs at extreme low tide until we reached the Drakes Estoro inlet to the Pacific. We rested a while, built a fort, and the boys splashed in the cold waters of the ocean. On the way back, at sunset, I stopped to make the images of waves, camera on tripod for long, slow exposures. Meanwhile, I kept a weather eye out to make sure the boys didn’t kill themselves trying to climb the unstable cliffs, or whack each other too hard with driftwood from the beach. In other words, a good time was had by all, each of us in our own way! 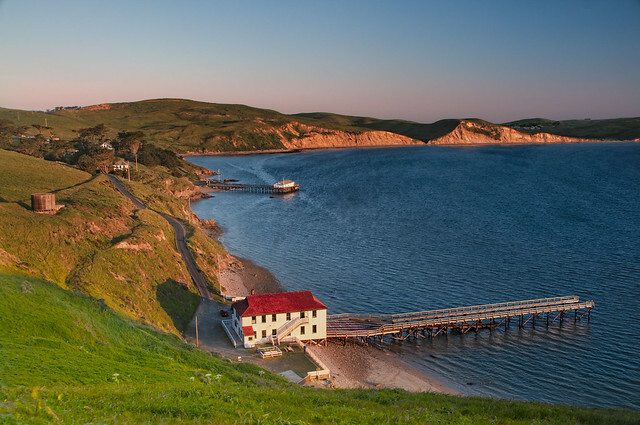 If you are interested in Point Reyes, you might like the Point Reyes category on my blog and Point Reyes and the Marin Headlands, my postcard book. The postcards in this book show scenes from Point Reyes, Drakes Bay, Mount Tamalpais, the Marin Headlands, the Golden Gate, and more. The world’s best swing is under an old oak tree on the Bolinas plateau facing the Mount Tamalpais ridge line. It is shown here under the oak tree by starlight with the moon rising, in a six minute exposure. A monster low tide occurred at the same time as the early winter sunset. Taking advantage of this conjunction, a friend and I wandered out on Duxbury Reef. Duxbury Reef, shown in the linked story from above, is one of the largest shale reefs in North America. It lies west of Bolinas in Marin County on California’s north central coast, and north of San Francisco’s Golden Gate Bridge, within Point Reyes National Seashore. Like Atlantis lost beneath the waves, the landscape you see in this image is usually far beneath the water. In fact, as sunset quickly turned to darkness we hurried off Duxbury Reef ahead of the massive oncoming tidal surge. Our route off the reef took us through arched tunnels normally hidden by the ocean, and past the feet of massive cliffs to the footpath at Agate Beach Park. Exposure data: 35mm, four exposures at shutter speeds from 2 seconds to 2 minutes, each exposure at f/22 and ISO 100, tripod mounted; exposures combined in Photoshop. Comment: I used the 2 second exposure to capture the sunset colors, and the 2 minute exposure to capture the much darker foreground of the reef. The exposures were combined using layers, a layer mask, and a gradient. The longer exposure also allowed me to create the attractive fog-like effect, derived from the action of the water in motion. One of the most powerful tools we have as photographers is the ability to manipulate the viewer’s sense of scale. Why does this matter? When the viewer first looks at an image they look to think they have have correctly assessed the contents. If, in fact, they realize they have not, or they sense ambiguity in the subject—as in, “What exactly am I looking at?”—the result is a double-take. This double-take leads directly to a clean slate. By misdirecting the viewer, we have given them the chance to view some portion of the world with new eyes. This means showing people something in a way they haven’t seen before—which is the goal of much photography. Case in point: I shot the image above on a rock at low tide in the intertidal zone at Drakes Beach in Point Reyes National Seashore, CA. For all the world it looks like a vast landscape from above, but as soon as the caption is noted the viewer will automatically adjust scale and visual expectations. We are very pleased to announce that Cameron + Company has released three postcard books of my work. Each of the three postcard books each contain twenty detachable postcards. 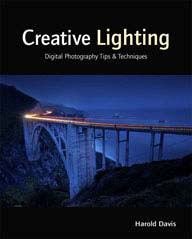 They are high-quality productions on thick matte stock. These postcard books are sold through gift shops, card stores, and bookstores, and retail for $9.95 each. Yosemite Dreaming: Postcards in this book show Yosemite in winter, Vernal and Nevada Falls, Mirror Lake, Yosemite Valley, the view from Inspiration Point, and more. Point Reyes and the Marin Headlands: Postcards in this book show scenes from Point Reyes, Drakes Bay, Mount Tamalp;ais, the Marin Headlands, the Golden Gate, and more. Classic California: The black and white postcards in this book show scenese from Big Sur, Joshua Tree National Park, Owens Valley, the Eastern Sierras, the San Francisco area, Yosemite, and more. On Christmas Day I calculated that from the summit of Wildcat Peak the sun would set directly behind the middle of the Golden Gate Bridge. This seemed like a great excuse for hiking off some excess holiday indulgence, so in the afternoon I grabbed Julian (my oldest son) and we made for the Inspiration Point trailhead my cameras and tripod in tow. We had a jolly time on the trail, and there were lots of happy people out and about, mostly with dogs and extended families. But up on Wildcat Peak it seemed that the band of coastal clouds would prevail. The Golden Gate could not be seen. Stubbornly, we waited for sunset on the off-chance that there would be a brief respite in the weather—preferably just when the sun was setting behind the bridge. One of Julian’s endearing traits, and one that serves him well, is that he is almost never willing to give up on anything, even against all odds. But the shot I’d prepared for didn’t seem likely. The sun was still above the cloud bank, but it was going down without the bridge being visible. So I started fooling around with my 70-300mm zoom lens. If you’ve ever pointed a lens with telephoto focal lengths at the setting sun and rotated the manual focus ring, you’ll have observed that the closer you focus the more out-of-focus the sun gets—and (this is the interesting part) also the larger the sun gets. This optical phenomenon is particularly true when you are shooting wide open at the maximum aperture of the lens. I was having fun making the sun into a big orange ball that filled the entire frame by focusing my 300mm to about ten feet when all of a sudden the thought struck me, why not put something in the foreground? There was no time to be lost. The big round ball at the horizon was setting into the fog bank. I hurried to try to find something interesting and close, and focused on a patch of bare weeds. Then, before I knew it, the sun was gone and the world turned gray and colorless. The actual exposure settings for this image were, using my lens set to its maximum 300mm focal length, 1/8000 of a second at f/6.3 and ISO 200, hand held. Back home, when I showed Julian the finished image, he was perplexed: “You made that photo from that litttle, random weed?!! ?” he asked. In life, often we go out looking for the dramatic sunset behind the Golden Gate Bridges in our lives. But it may be the little random weeds that really matter. Somehow, in these days of renewal when the sun starts to come back from its long journey towards apparent oblivion, I find myself looking to photograph the sun, perhaps to assure myself that it is real. It always helps to put something in the foreground like the waves shown crashing in their interference patterns at North Beach on Point Reyes, California. Foregrounds, random weeds, and the return of the sun: the makings of a meditation. Without darkness there is no light, and when things are darkest distant light seems brighter. Metaphor and solace, perhaps, for these troubled times—or at least my meditation on this “grab shot” from the bluffs above Drakes Bay in Point Reyes California. I made this photo during my recent Photographing Waves workshop. One doesn’t often think of landscape photography as requiring good reflexes and split-second timing, but sometimes it does, and this image is a case in point. Sunlight, filtered through a gap in the clouds, illuminated the cleft only very briefly. Blink and it was gone. 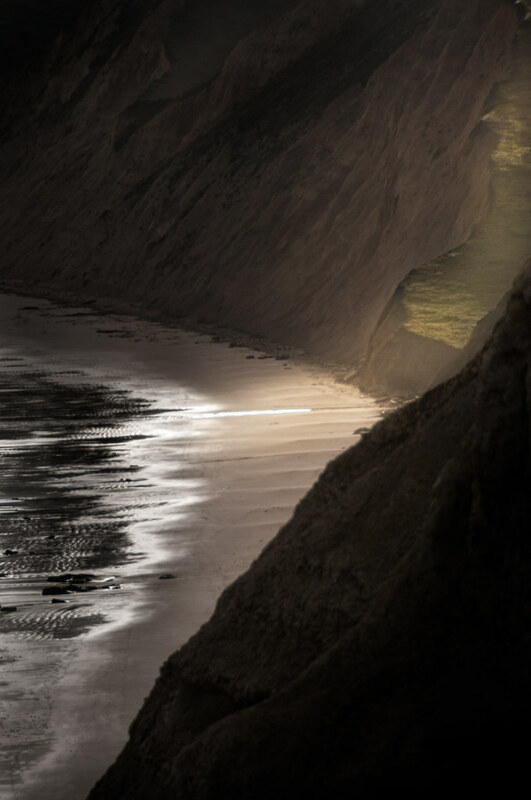 I underexposed to increase the contrast between the dark cliffs and the sunlight, and shot with the longest lens I had with me. Here’s the EXIF data: 200mm, 1/640 of a second at f/8 and ISO 200, hand held.